How Late in the Season can it Snow? After experiencing a blockbuster 2013 – 2014 winter season, winter kept its strong grip on the Northeast even into mid - April when one last round of snow blanketed the region from the 15th to the 16th. Many may be wondering if snow this late in the year is truly an anomaly or if we have experienced more impressive late season snow events in years past. We analyzed the records and snow normals to find the answers. The final measurable snowfall of the season typically occurs by the second to third week in March across the Mid - Atlantic and New York City metro area, while those in New England usually end by the last week of the month. Although nearly everyone along the I – 95 corridor saw flakes on April 15th - 16th, only the major cities in New England recorded measurable totals (New York City, Philadelphia and Baltimore recorded trace amounts although nearby suburbs had measurable totals). Comparing this year to the normal last snowfall shows us that the April 15th - 16th event extended the snow season by 15 - 20 days in both Hartford and Boston. 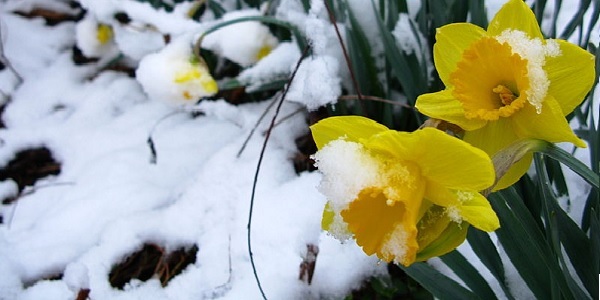 Since New York City and the Mid Atlantic had their last measurable snowfall on March 3rd and March 25th, respectively, the Big Apple actually ended about 2 weeks early while the Mid Atlantic ended 10 – 15 days late. Looking at some of the latest snowfalls on record shows us that measurable snow on April 15th - 16th is not unprecedented. As seen in the table below, Baltimore measured 0.3 inches of snow as late as April 28th in 1898 and those in New England dealt with snow on May 9th - 10th in 1977 when 1.3" and 0.5" fell in Hartford and Boston, respectively. In fact, New York City measured an astounding 3.0 inches back on April 25th, 1875. While the April 15th - 16th snow event did not break all time latest snow records, it did break a few daily records. It was the first trace of snow ever for Dulles Airport in Virginia on the 15th and Allentown, PA set a new daily record of 0.3 inches on the 16th. Given that this winter did feature mid – April snow, did that make the 2013 – 2014 winter season longer than normal? Well, since the first measurable snowfall of the season was a bit delayed this year (around December 8th), this helped offset the late end in New England. The total number of days between the first and last measurable snowfall was actually within 5 – 10 days of normal for both Hartford and Boston. Interestingly, this season was 2 weeks shorter than average in New York City at just 85 days. Farther south, the season was indeed longer than normal. Usually, Philadelphia and Baltimore see 90 and 86 days between the first and last measurable snowfall, respectively. This year, the cities saw the season extended by about 3 weeks with 107 days each; however, this is amazingly not record breaking. During the winter of 1940 – 1941 and 1953 – 1954, Philadelphia had 144 days between the first and last measurable snowfall, while a span of 136 days occurred during the 1996 – 1997 winter in Baltimore.